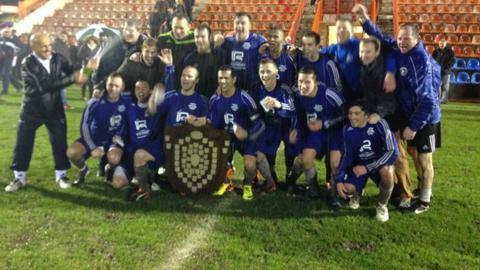 Two parishes have pulled out of Jersey's annual Trinity Shield football tournament with a lack of players. St Mary pulled out last week and St Martin have followed them after failing to raise a team for Tuesday night's game against St John at Les Quennevais. The Shield is for island-born players who play for the parish in which they either live in, or where their families lived when they were born. after they won for the first time since 1929. It means there is only one preliminary round match this year, in which Trinity take on St Peter, with the winners of that fixture facing St Clement in the quarter-finals. On Saturday St Brelade have a western derby with St Ouen in the last eight, while Grouville travel to St John and 2010 champions St Saviour meet on 27 December. The tournament is held around the Christmas and New Year period as many players return to the island for the festive season and play for their parishes.